That's me!!! We've been busy with a lot of things since yesterday that I was only able to visit a few blogs. Actually, I only visited a few the whole week through! Soweee!!! We closed with the bank today for this new house. I'm not happy with the way it went but it's our best bet at the moment. A lot of things had happened between us and this bank that everything they do right now just rubs me the wrong way. We are weighing our options right now and will take it from there. I hope you're all having a great week...better than mine anyway. It's almost TGIF....yay!?! I guess it's a "Yay" for us because we are somehow 'getting on' with our lives after all the 'chaos' of moving and all that comes with it. Have a great Thursday/Friday everyone! Thanks for the constant visits! 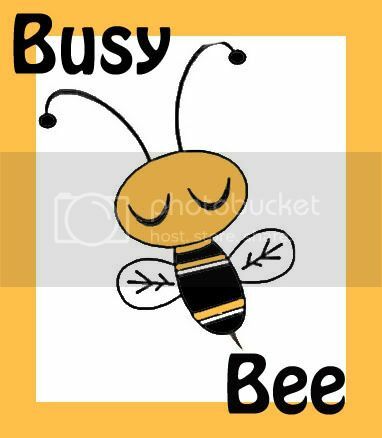 Hey busy bee. Don't wear yourself out. Like I said one thing at a time. you'll surely be a VERY busy bee with all the unpacking and arranging! but i know it will also be fun since you'll be doing it with the help of your little princess and hubby. sad to know about that bank thing. hope there'll be some other way, whatever that is. take care and take your time! elow po! My gosh moving is so stressful indeed. We're moving in our apartment (finally) this July 1 but good thing only my mom has to worry about it hahaha (poor mom). She has to worry about having the electricity and phones connected on the day we move plus we have to have furnitures moved in and some issues with the bank too. Anyway, I know that when the details are ironed through you can return to your normal life there. So hang in there busy bee hehehe. taksyapo! ot eku byasang mag add link keni. atin kung ikit a kafangfangan website http://eksite.com/ek.html?378/2.14.2008.eK! lawen me itang " the kafangfangan you miss hearing" makatula ya darling balada nanung gigigitan ku kening desk ku. Check it out and tell me what you think. hi busy girl! hehe. i can understand about not able to visit other sites coz youre busy. bawi ka na lang next time, hehe. btw, congrats on your new house. have a fun-filled day, jules. Hello ate J. yeah that's alright if you cannot visit me. I understand how busy mom you are right now....muaaahhh!